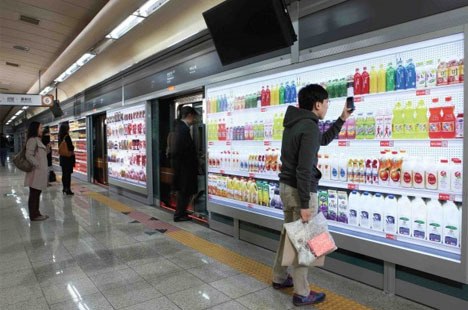 Imagine waiting for the train while picking out your groceries from a display case filled with products identical in size, scale and color to really grocery store shelves. If the first round of the digital revolution was about making the real virtual, this time it is about making the virtual real again. 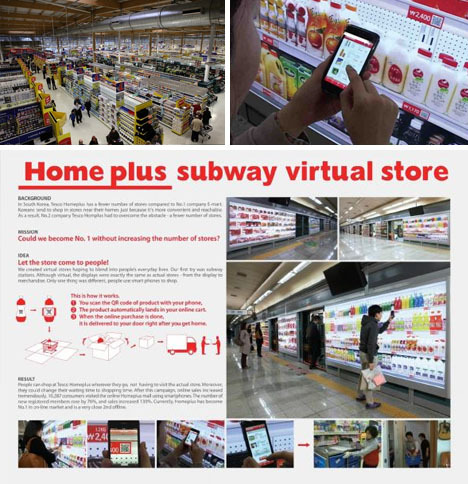 South Korean grocery chain Tesco was looking for a way to one-up their major competitor – impossible to do in terms of physical shops due to a lack of actual stores; hence, they turned toward the world wide web with a combination of mobile phone and QR code technologies. Using smartphones, shoppers can browse the isles during time normally spent idle anyway on their way to or from work. Their purchased products are then delivered by the store, waiting for them when they get home and ready to be put right into the kitchen cabinets, refrigerator or freezer. Needless to say, the pilot program was wildly successful, and their sales now rival those or the largest physical grocery chain in the country. More than that, though, this concept redefines space, and opens up whole new possibilities for doing away with cumbersome big-box stores.